I recently bought a HB36 "vintage", and I like it very much. However, I still have some unanswered questions on this guitar: it was sold as "HB36", however the label inside the guitar is "HB35 vintage". I've just checked on the Washburn website, and I noticed the the HB36 should have a spruce top and ebony fingerboard, whereas mine has an aged maple top and a rosewood fingerboard. And the top is darker than on the photo of the Washburn website. Anyway, I had a first look at the forum, and couldn't see any topic on the HB36 or HB35-vintage. I doubt I'm the only owner of this model, though. The guitar is great: good lutherie, beautiful "aged" look. The sound is rich, the bass and mids are great. I just find there could be more treble, and I'm considering changing the pickups one day (maybe BareKnuckle? ), although there really is no hurry. But I couldn't find a specific topic on the choice of new pickups for HB35 or HB36... have I missed it? Howdy Ncreff. Welcome to the forum. Way to make an entrance! Note my post count, and the fact that I'm a former MIJ HB35 owner. I've never heard of or seen an HB36. That said, I LOVE the look of that guitar! Be a shame to lose the aged PU covers, maybe you could transfer them to the new p'ups. Give customer service a shot at answering an email. Last I tried, they were very responsive. You could provide us all with accurate info on this model from the get go. You have the only existing HB35 Vintage. 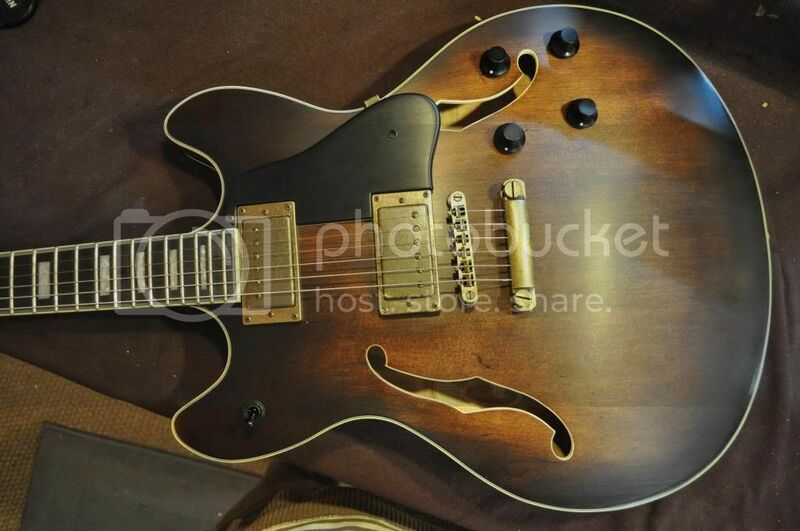 It's the prototype for the current HB36 and unlike the HB36, does have a maple top and rosewood fingerboard. I would say now don't change anything on it. Nice to have a one of a kind. Tom. I love the pickup covers indeed! If I ever change the pickups, I'd like to be able to keep them, if it isn't too difficult or expensive to do so. I generally don't like the idea of a relic guitar, there's something fake to it in my opinon (I know it's quite subjective). But I think the vintage look of this guitar is really great: it has been done with taste, without excess. The top also has something of an old cask, although I find it slightly too dark, but it's just a minor detail. The ebony knobs are very nice. It just might be a problem for those used to adjust very precisely the tone and volume: you just have one single white spot on each knob, without any graduation from 0 to 10. I currently use it with my jazz - soul band, instead of my Squier Telecaster Classic Vibe (which I kept). Of course, the HB and the Telecaster are completely different. I also have to say, believe it or not, that this is my first guitar with humbuckers instead of single coils. I had been thinking for some time about a semi hollow-body guitar: I didn't have a huge budget, so I wanted it not too expensive. But not too cheap or looking like a toy either, and with a good and reliable lutherie that would make it worthwhile to have further improvements later on (pickups for instance). And it seems that the HB35 vintage is the ideal solution. First time I played the HB, I found the sound very rich and warm. The bass and mids are very nice. Playing a few jazz chords and licks was a pleasure. Could this warmth be explained by the satin maple top (faded look), where there is no (or less) lacquer finish? Then I tried it with the overdrive, and I loved it too. Want to play an open G AC/DC style chord? Some muddy blues rock? Perfect! The neck is very comfortable. I used to play a lot of acoustic jazz in the past years, on a gypsy guitar. So when I played an electric guitar again last year, the neck of the Telecaster Classic Vibe proved a bit too thin. Way too thin, actually, when chorusing, bending the strings... And now I think the neck of the HB36 (or 35 vintage) is perfect for me, feeling very comfortable for both rhythm and solo. - I'd like to have more treble, and that's why I might consider changing the pickups. In my opinion, the middle position could be brighter or, how to say it... more "shiny". When I say that, I think of tones like those of BB King, Albert King. And that would be needed too for the funky rhythm (old-school style) that I play in my band (I love the sound of New Orleans funk, the Meters for instance). Last, if I change the pickups, I may also consider an out-of-phase option because I've always been moved and thrilled by the Peter Green sound. Are there any pickups that would allow all these options, while keeping the warmth of bass and mids...? I'd love to find that. - The shop where I bought this guitar isn't very close to my place, and I still have to go back there for some adjustments. The 1st (high e) string sizzles a bit on the 10th fret, a lot on the 16th, and really a lot on the 19th. I'm not really worried, I just hope that there is no problem with some frets being too high. I guess that's just something to be checked and adjusted by a luthier, and I shall have it done soon. Anyway, I'm quite satisfied with this guitar, and hope to be even more satisfied in the future. Remember if you do change anything to save the old parts, some day it will effect the value. Tom. Thanks for your comments and advice! Actually, I'm not so sure anymore about the details of my guitar. It seemed to me that the top was maple, but now I'm beginning to doubt. I'm not an expert at differenciating different kinds of wood, especially if it's laminated. However, the fingerboard really doesn't look like it's ebony. When I looked at the photo on this page, the details on the guitar's top show that it actually isn't my guitar. So I tend to think that mine might not be unique. There's another review where the wood used for the top seems very different of mine. So would it be spruce, while mine is maple? ncreff....maybe, like I often do, your eyes missed this post from WEBgUy, who is a Washburn employee working with customer service. I'd take that to the bank. Your fretboard isn't ebony it's rosewood. And you've got a maple top, per WG. As to the treble, it's quite possible that simply changing some components of the wiring harness will have a profound impact on the sound, without changing the pickups at all. premium pot's, and different capacitors may well open it up considerably. Later, if you're still looking for more, leave your now premium harness in place, and have the existing pup's rewound by someone. There are a lot of builders who will do that for you. You'll essentially end up with boutique custom wound p'ups and maintain the cosmetics, which in my opinion, are stellar. If the lutherie is good, and the neck is great....don't let it go. Electronics are easily modifiable these days, and guitar that you bond with geometrically is too valuable to let go, and often impossible to replace. Problem: You may have noticed that as you turn your electric guitar's volume pot down the sound loses treble becoming progressively bassier. This is particularly noticeable with single coil pickups - humbuckers are not affected nearly as much. This treble loss is not a problem for everyone, as many guitarists prefer to roll off the volume slightly to get a slightly darker and less overdriven sound for rhythm playing. Turning up the volume for leads then not only boosts drive, but brightens the sound too, helping it cut through the mix better. So I'd say the golden rule is - listen to your guitar, if the loss of treble is too extreme for your taste, start tweaking. If it sounds fine to your ears - leave things as they are. Why it Happens: This is due to the way the pickups, pot and the capacitance of the cable work together as a lowpass filter circuit similar to a tone control. Lowpass filter circuits have a cutoff frequency, above which they cut all frequencies. With the volume control up full the frequencies being blocked by the filter circuit are very high and do not have much audible effect on the tone. When you change the resistance in the circuit by lowering the pot (raising the resistance), the filter cutoff frequency moves down into the audible range and starts cutting audible higher frequencies from the sound, making it less trebly. The cure: Higher quality, low capacitance cables have less affect on the treble as they move the cutoff frequency to a higher frequency. Unfortunately these cables tend to be very expensive and in many cases almost unusably thick, stiff and heavy. A shorter cable has lower capacitance, but that obviously can affect your movement onstage. However, you can compensate for the treble loss by using a capacitor to "bleed" more treble frequencies into the signal as the volume is turned down. This effectively makes a highpass filter to offset the high frequency losses of the lowpass filter. I put this treble bleed mod on my tele with great success, and replaced the harness in my HB35 type guitar, also maintaining the brightness when decreasing volume. Harnesses matter! We put too much emphasis on the pickups, IMHO. Thanks Tio! I had indeed seen WEGgUy's answer, but then I was doubting I had given the right information. Meaning I was not so sure anymore about the maple top. I had another rehearsal today, and I have to say that it was much better regarding treble. Last week's amp was a Fender Hot Rod deluxe. This week's was only a solid state Fender Deluxe 112, but it had much more treble. Whatever I choose to modify on this guitar, I will not do it too quickly. I prefer getting to know better how it can really sound, which might take some time, and being familiar with all its possibilities. Your contribution on capacitors and the treble bleed mod is really welcome. That's something that I might do before any pickup change. And you're right: I'd really like to keep the cosmetics unchanged inasmuch as possible. 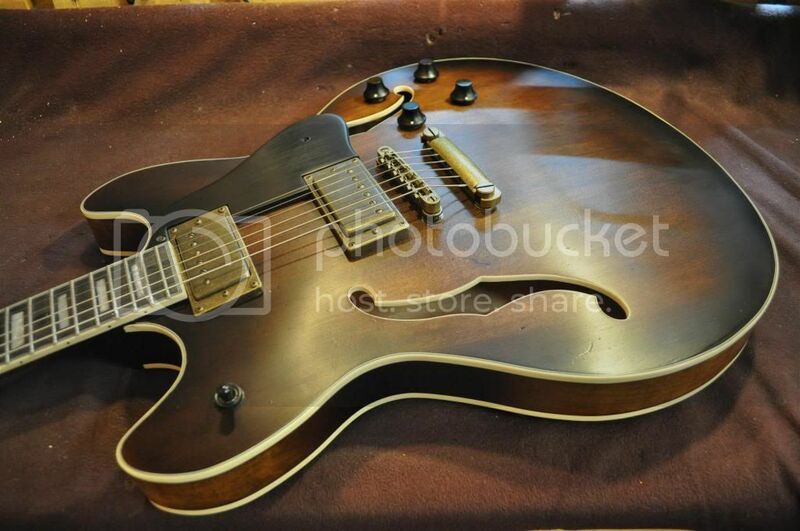 I am really interested in buying this guitar which I find gorgeous ( the model with rosewood fingerboard), is there anyway Washburn has still some in stock, or should I look into the second hand market? I would guess no, as W.G. says it is the only one made. Tom. I realise this is a very old post but I also bought what I thought was an HB36 Vintage only for the label inside to say "HB35 Vintage". 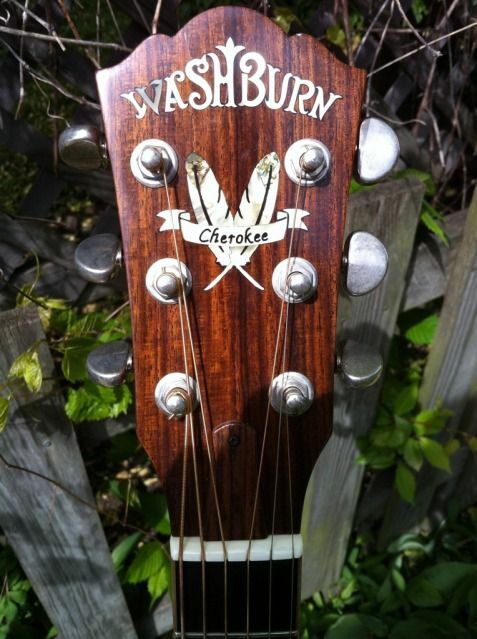 According to earlier responses on here that gentleman was led to believe he had the only HB35 Vintage in existance as Washburn did not make an "HB35 Vintage" - only the HB36 - and the guitar that guy had was a prototype for the HB36. Well, my guitar looks very much like the pictures in the first post (ie darker top etc than the subsequent HB36) but mine also has a label inside that says "HB35 Vintage". Therefore, rather than the HB35 Vintage being any kind of prototype, Washburn customer services have suggested to me that the "HB35 Vintage" labelled guitars may have been a very limited edition UK run - as the US did not release an HB35 Vintage of any kind. This seems to make more sense seeing as I have one and this other chap also has one. As to what differences (if any) there are in the woods between these HB35 Vintage labelled models and the HB36 I'm not really sure.